Do you know what the secret to flavourful and authentic Mexican salsas and guacamole is? 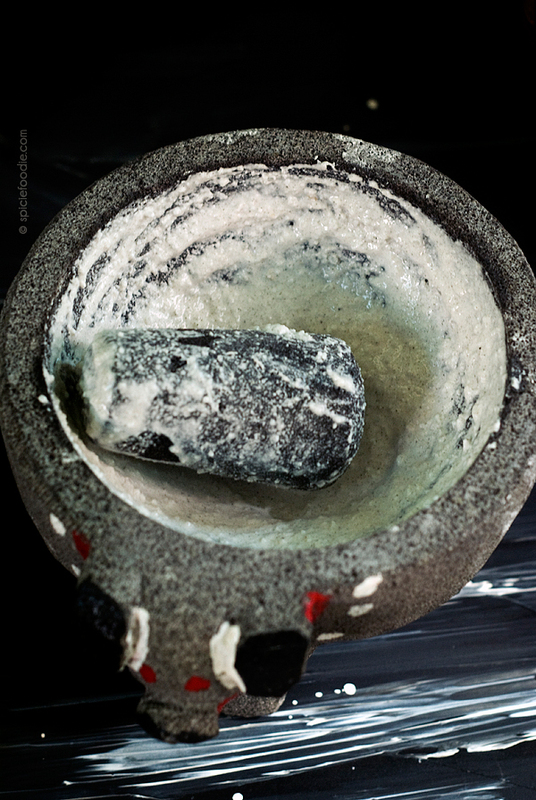 A molcajete. This kitchen tool has been an important one in the history of Mexico and its culinary culture. 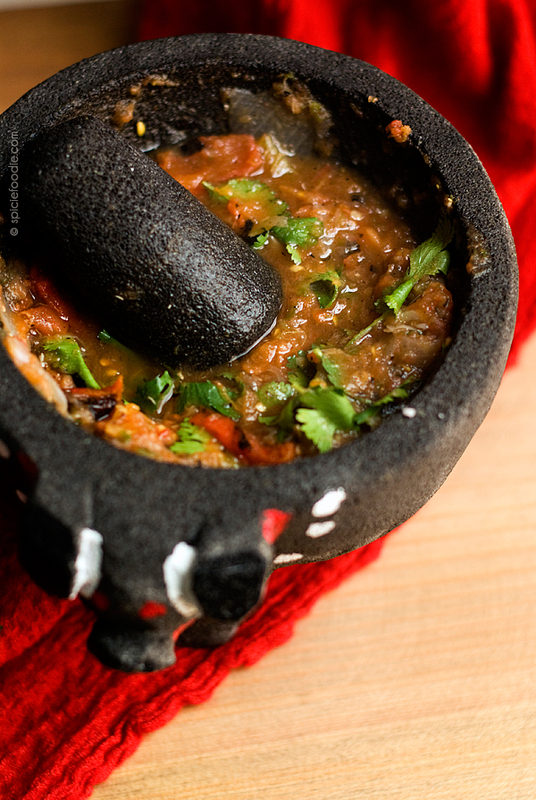 Made from basalt (or volcanic stone) the molcajete (or mortar) and tejolote (or pestle) will give your Mexican dishes that authentic and rustic flavour that can typically only be found in the most traditional kitchens. 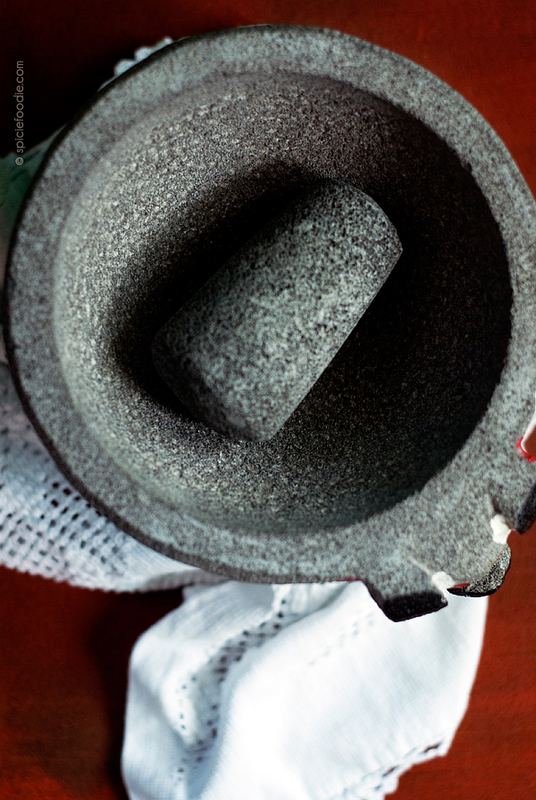 A molcajete truly is a must in your kitchen. Even if you don’t normally make Mexican salsas or dishes, this heavy stone mortar and pestle can be used in preparing so many international foods. But before you get busy in the kitchen you have a little work to do in preparing the molcajete. It’s not difficult work but you will have to put some muscle work into it. 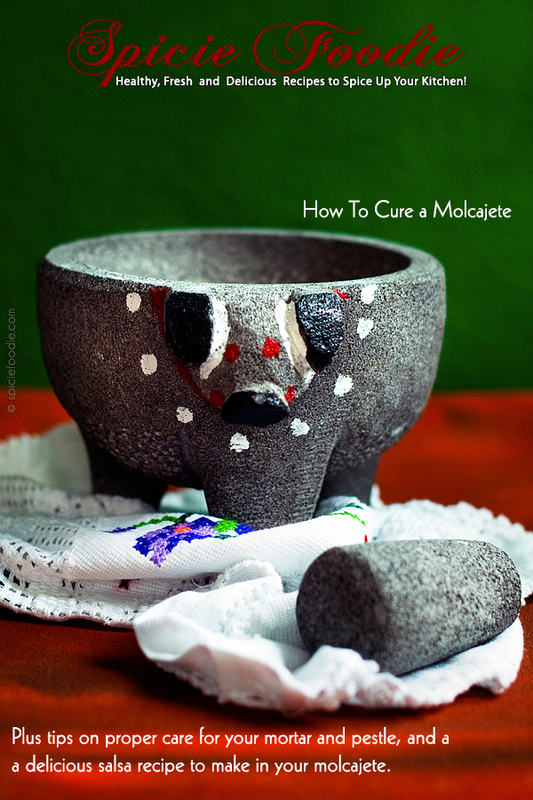 I wrote a step-by-step guide on how to cure (or season) a brand new molcajete, and you can use the tips for any stone mortar and pestle. Read the how to cure guide here. Of course once you’ve cured it you’ll want to get started on making salsas, guacamole, and grinding spices. I am sharing a great beginning salsa recipe so you can break that molcajete in. You can get the recipe for the salsa on my About.com column here. 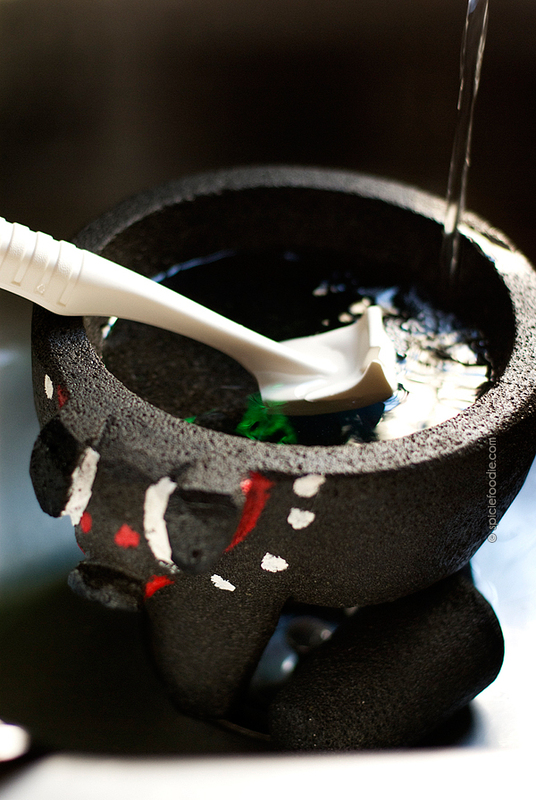 Did you know that you mustn’t ever use soap when cleaning a stone mortar and pestle? It will make any foods or spices prepare in it taste like soap — yuck! So, I wrote a guide all about the proper care and maintenance for a molcajete. That article can be found here. Do you own a molcajete? If so, what is your favourite thing to prepare in it? I don’t have a molcajete, but always think about getting one when I see them. I should just do it! And now I know how to cure it. Thanks! I do own a molcajete and there is nothing better than creating salsa Nancy! Your recipe looks delicious! Bookmarking it for a later date! i spent a summer teaching in mexico and received one of these as a gift from the people i was staying with. i accepted it as beautiful and cultural but had no idea just how great it was in the kitchen! i’ve since learned to use it, both on traditional mexican dishes like salsa and guacamole but also for general grinding needs, from nutmeg to cocoa beans to lavender buds. it’s beautiful and so useful, i just love it! I had a question about this type of mortar. Since it is more porous, is there any issue with garlic botulism? I’m afraid to use garlic in mine cause of how easy other stuff can get stuck in the little cracks inside the bowl. I’ve never heard of that but of course it is always a good idea to be safe and prevent any contamination. To properly clean my mortar I use lots of running water and also a stiff brush to really get in all of the cracks to remove any food. Also if you feel there is too much food stuck in the little cracks (or pores), you can grind up some rock sea salt to help pull it out. got it! thank you very much! Garlic is a natural antimicrobial and therefore SHOULD absolutely be used to season your molcajete. You WANT it to get into the pores of the molcajete. Also, in Mexico guacamole is never made in a molcajete. Salsas and moles yes, but guacamole…no. That’s an American thing. Thank you for your comment. I’m sorry but I have to disagree with you, in Mexico (by the way I am Mexican and live here too), we do make guacamole in a molcajete. This is a very old tool to the traditional Mexican cuisine that was used for many foods. Also some Mexican cooks say that this is the best or only tool for preparing guacamole. But just like anything, every family or cook’s personal preferences are different. Sorry, had to salvage your comment from the wrong folder. If you have a Hispanic or Asian food store near you, that’s a great place to look for a good and inexpensive mortar and pestle. If not online like on Amazon or MexGrocer they have really great ones to choose from.